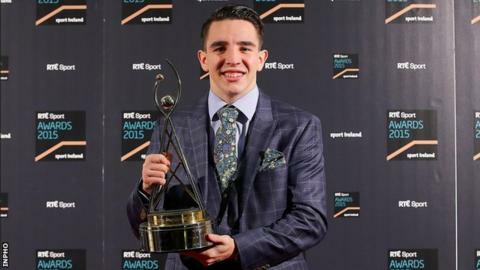 Belfast's Michael Conlan has been named RTE Sport Person of the Year for 2015. The 24-year-old became the first ever Irish World Amateur Championship boxing champion after winning bantamweight gold in Doha, Qatar, in October. Conlan, who also won the European title, was also named BBC Northern Ireland's Sports Personality of 2015. Michael O'Neill came out on top in the Manager of the Year category following Northern Ireland's qualification for Euro 2016 by topping their group. As well as acknowledging this year's sporting achievements, Kilkenny hurler Henry Shefflin was inducted to the RTÉ/Sport Ireland Hall of Fame. The forward won 10 All Ireland senior titles and 11 All Star awards during a stellar career with the Cats. The RTÉ Sport Team of the Year award went to Premier Division and FAI Cup winners Dundalk after a public vote.